This luxury 5-star hotel is the ultimate retreat if you wish to make your holiday memorable. At the hotel, you can relax in the lavish rooms and enjoy modern facilities like the spa, a pool, and a gym. Free water sports like Water Skiing, Wakeboarding, Sailing and SUP surfing are the star attractions. The food is great and the staff is extremely cordial. Royal Palm Hotel Grand Baie Mauritius is 5-star hotel situated amidst the Indian Ocean and is just at the distance of 15 kilometers from the downtown area and 75 kilometers away from the airport terminal. 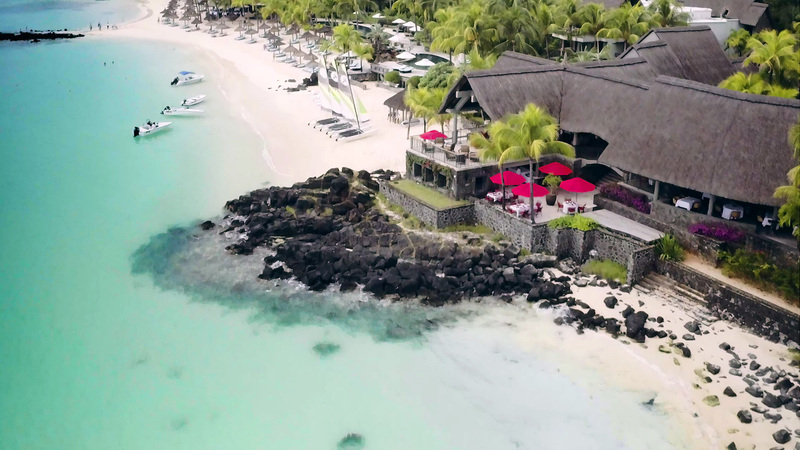 Get the feel of a little private beach resort at Royal Palm Hotel as it is arranged across the most appealing shoreline on the north coast of Mauritius. This is undoubtedly the most extravagant hotel in Mauritius - the vibrant hotel is a haven of quality, warmth, and solace. The hotel the best accommodation for couples and families. The biggest perk of accommodating at the Royal Palm Hotel Grand Baie Mauritius is that the hotel provides a wide range of activities within its premises. Also, the majority of the sports activities present at this hotel are free of cost. This property is an extraordinary choice as compared to other appraised spots in the area. Incredible cooking and impeccable service are parallel to offer an extremely pleasant affair to all the visitors. All the 84 suites at the Royal Palm Hotel Grand Baie Mauritius are designed in delicate tones, have walk-in wardrobes, safes, and fully-equipped fancy marble bathrooms. The Junior Suites include one bedroom that is canvassed in delicate tones. The Tropical and Palm Suites are situated on the ground and first floors, consisting of a spacious living room. The Garden Suites have two rooms, and the highlight of these rooms is the a la mode, fully-equipped en-suite bathroom. For a large group of travelers who needs additional space, they can simply look up to book a Senior, a Presidential Suite or a Penthouse. In case one wants space with extra luxurious amenities, there is a Royal suite which possesses two bedrooms, a private jacuzzi, pool, gazebo with mystic sea views. The guests at Royal Palm Hotel Grand Baie will get phenomenal staff both expert and amiable, the convenience of eateries just outside of the rooms, easy access to the beach from the hotel, and no additional charges for room services. Activities like scuba diving, lagoon trawl line fishing, big game fishing, motor boating, and trimaran cruising are provided on additional cost. Spa and tennis court are also present within the hotel premises. Guests will also get the beauty center facility which provides facial treatment, makeup services, manicures, pedicures, waxing, and other beauty services. The Royal Palm Hotel Grand Baie Mauritius has three on-site restaurants - La Goelette which is the leading restaurant of the hotel with the lagoons view. This restaurant serves international foods along with Mauritian cuisines. Other two eateries are - the lounge Plage settled beneath a centenary badamier which offers both snacks as well as international cuisine, and La Brezza, an Italian restaurant. The main lounge is nestled at an impressive rooftop overlooking the ocean. The guests can even enjoy the nightlife here, watching the live music performance while relishing their meals. Royal Palm Hotel Grand Baie Mauritius is an ideal destination for both family trips, and honeymoon couples. As it offers all kinds of amenities that will facilitate families, kids, and couples all. This is the most eminent spot around the Grand Baie Mauritius. The Royal Palm Hotel Grand Baie Mauritius has a staff of three specialized individuals for every room. Additionally, if you are on the beach, the staff will also be available there for your convenience to assist with any service you need such as moving your lounger to anyplace you want. They will likewise be instantly available to bring the beach towel for you every time you return after taking a dip in the cool beach. Are concierge services available at the Royal Palm Hotel Grand Baie Mauritius? Yes, free concierge service is provided to every valuable guest which includes dry cleaning, laundry services, and room services. Is the Wi-Fi facility free in the hotel? Yes, youll get the free Wi-Fi throughout the hotel. Does the hotel provide the parking facility? Yes, you will get the free parking facility as there is a spacious parking premise available within the hotel. Is there a shuttle service to reach from Airport to the hotel? The reservation team at the Royal Palm Hotel Grand Baie Mauritius can arrange the shuttle service for the pick up as well drop up service. What are the check-in and check-out timings in the hotel? The Royal Palm Hotel Grand Baie Mauritius is hustling with vacationer activities which breaks the calm atmosphere of isolated life. What was before a tranquil small fishing town is currently an occupied, present-day focused with loads of fun and frolics. Leisure activities at this property are of a world-class quality and abundant activities such as the water sports, Clarins Spa, having an expertise in beach related therapies, and a mixed palatable food customized as per the requirements of every visitor. The resort revels visitors with an open-air swimming pool, kids' pool, a private beach area, a library, and a tennis court and additionally a health club, and a steam room. The fitness centre supplies a gym club, gym instructor, and yoga classes on location. With such extravagant and plentiful of amenities, the hotel has gained a fair position amongst the most elegant hotels of the world. The hotel will satisfy precisely make your holidays a pleasant affair!